A recent market report from Pitcher Partners found that M & A activity in 2017 increased 55% compared with the prior year, with numerous industry players such as Morgan Stanley, KPMG, and more all suggesting that M & A activity is showing no signs of slowing down just shy of halfway through 2018. A supposed key driver of the heightened activity is a large inflow of capital into private equity funds over the last five years. Anecdotal evidence of this can be seen in just a few of the bidding names involved in announced deals for 2018 on the ASX; BGH Capital and Brookfield Asset Management’s bids for Healthscope (HSO.ASX), EIG Global’s pursuit of Santos (STO.ASX), Bain Capital’s proposed management buyout of BWX (BWX.ASX), and CDH Investments’ offer for Sirtex (SRX.ASX). With a bit of colour around what is driving the M & A activity, the prevalence of private equity vehicles in corporate transactions should come as no surprise. 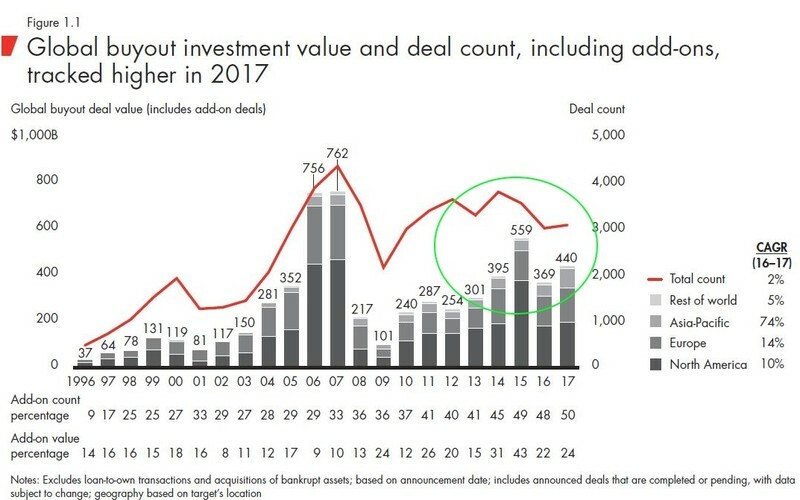 A 2018 report from Bain and Company, Inc highlights that more capital has been allocated to private equity in the past five years than at any time in history and yet, while the number and value of M&A transactions has steadily improved over that time (as seen in the chart below), this pick-up in activity has in no way gone close to utilising the total amount of capital that is currently set aside for this purpose. The end result of this mismatch is an enormous amount of dry powder – or uncalled capital – sitting on the sidelines, as much as an estimated $1.7 trillion dollars. As the capital continues to accumulate, the pressure to do deals increases. The commitment to reach stated return targets on the invested capital requires that the capital be put to use, and it’s not unreasonable to suggest a significant portion of this private equity money is soon to hit public markets in search of returns. Understanding these underlying dynamics of the private equity market presents an opportunity to capitalise on what can be described as structurally forced activity. At some point, the dry powder will have to be put to use, and the increasing opportunities that publicly listed companies offer as potential merger and acquisition targets allow a broader base of investors to take advantage of the apparent structural limitations of the private equity model. It is our belief that an M&A focused strategy can be a good addition to many investor portfolios generally, primarily because of the defensive characteristics of such a strategy but so too, as an alternate source of alpha that is not easily obtained elsewhere. However, if our thesis (and that of KPMG et al) is correct, then the outlook for such a strategy may be even better in the months and years ahead than it has been for quite some time.